Although I love all the vegetables from my garden, the ones I love the most are those that seed themselves, need water only in the driest months, and produce for multiple seasons. I haven’t planted lettuce for at least a decade, but it is growing everywhere and anywhere I’ll allow, including in the flower beds and gravel paths. From late winter through to the first hard-frost (and sometimes beyond! ), we have more lettuce than we can eat and plenty to give away. Gardening friends here in Oregon’s Willamette Valley have asked me what my trick is – but there’s no trick. Just leave a few lettuce stalks to go to seed. The following late February or early March, you should have dozens of baby lettuce plants popping up. Keep letting a few stalks go to seed, and within a few years, you should have enough for your family, your friends, and the neighborhood deer. Even after a nasty winter where the temperature bottomed out at an unusually low 9 degrees, I still have self-seeded red and green lettuce, red and green chard, arugula, mustard greens, and Siberian kale galore. Quantities depend on your taste. Oven roast pecans at 350 until the meat just starts to turn golden, about 5 minutes. Leave a few for garnish and break the rest into smaller pieces. Chop apricots and cranberries. 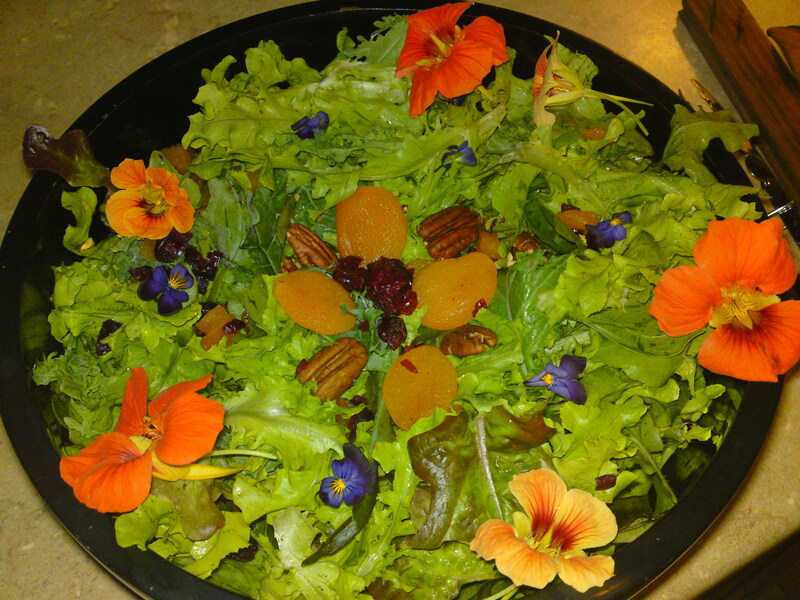 Toss nuts and dried fruit with greens and top with nasturtiums and violets. Leftover grilled chicken turns this lovely salad into a main course. If you’re not absolutely certain what a particular flower is or whether it’s edible, please research before consuming! That is really a bejeweled looking salad…good enough to eat. “It looks too good to eat.” Thanks for the tip about the flowers. It really dresses up a salad when to tomatoes are not ready yet.